The kit fit my 1974 Cerwin Vegas perfectly. The instructions, especially the online videos, were extremely helpful (the lacquer thinner option proved to be a much better solvent than the denatured alcohol in my case). I was very satisfied with the purchase--my speakers are back from the dead and sound like new. Thanks again, speakers were in the garbage and now in my living room!! its the second time i order cerwins spkr repairs. both times they were easy to fix and sound outstanding the next day,, great product,!! Great transaction overall.Professional company to deal with.Highly recommend. I bought these surrounds to repair my 12" Cerwin Vega woofers. This kit is so easy to DIY! I watched the video on YouTube on how to install the surrounds to the woofers. Instructions come with the kit but watch the video. 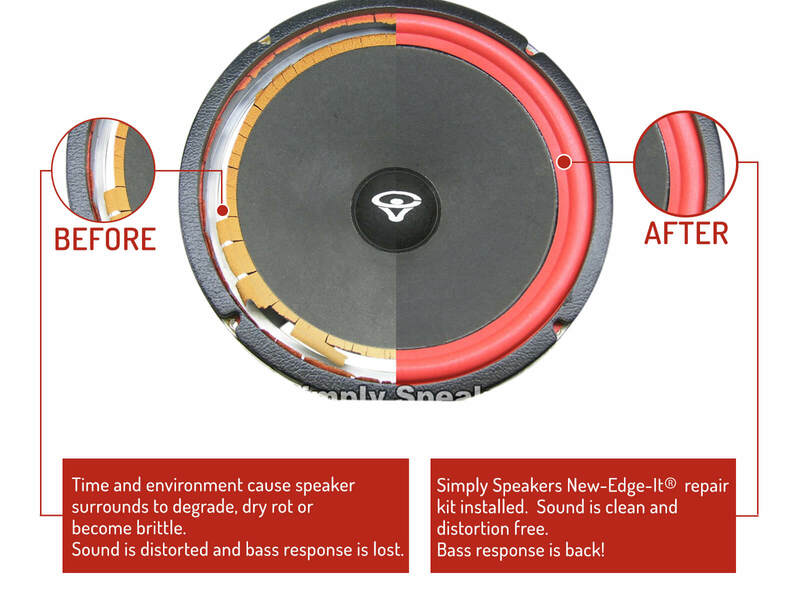 Simply Speakers makes a great product. I will always buy from them! Refoaming was actually alot easier than i thought it would be. Great instructions on both paper and youtube. I was also worried about the alignment process but it turned out to be very straight forward after watching the video om youtube. Thanks! I received my order in a good time and everything was in good order considering I'm so far away. After reading instructions and watching the videos this replacement was easy and a lot cheaper then replacing speakers themselves. There back to there pounding state as they were in the 90's and look like new. Thanks for having somewhere to get these to keep the fun in the music, and the party going. 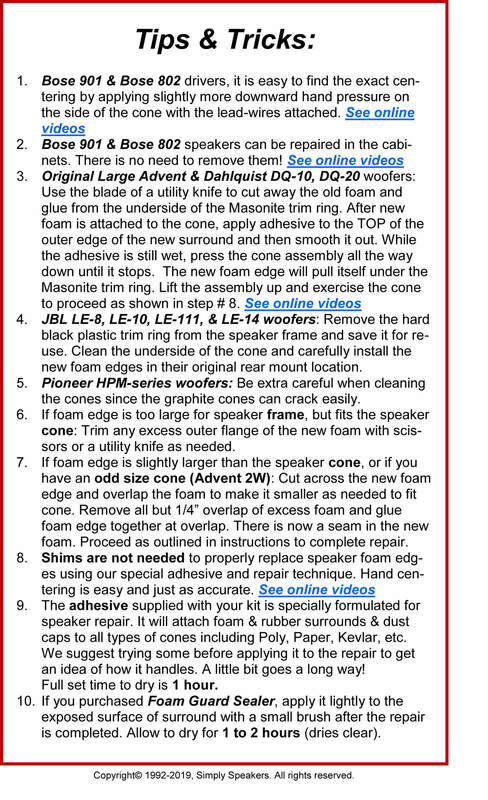 I have previously had my speakers repaired by a service company. I chose to give it a try myself. 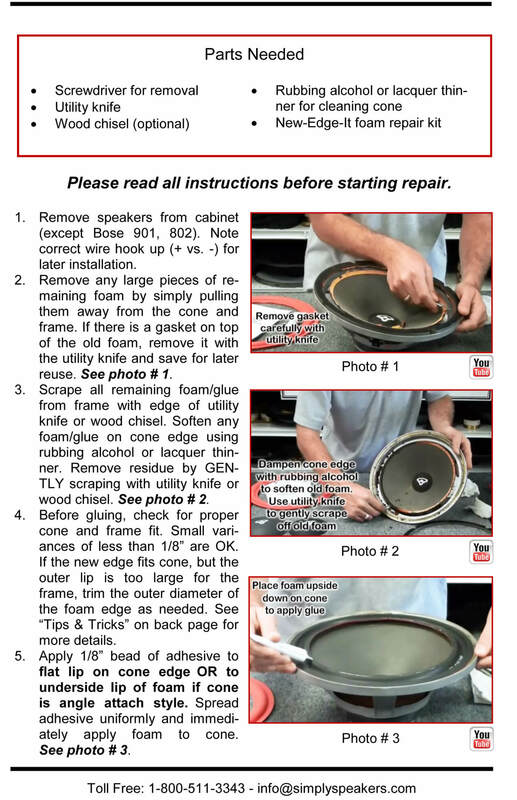 The instructions were easy and the speaker repair was a complete success. A: Please order this kit for the D7. Part # FSK-12AR. Thanks! Q: will this kit fit AT-12's? A: Yes! This kit fits the Cerwin Vega AT-12. Q: I have the E312 series, I noticed it says the cone runs small. Will that affect the speaker in any way? Or should I look at a different route of repair? Thanks! 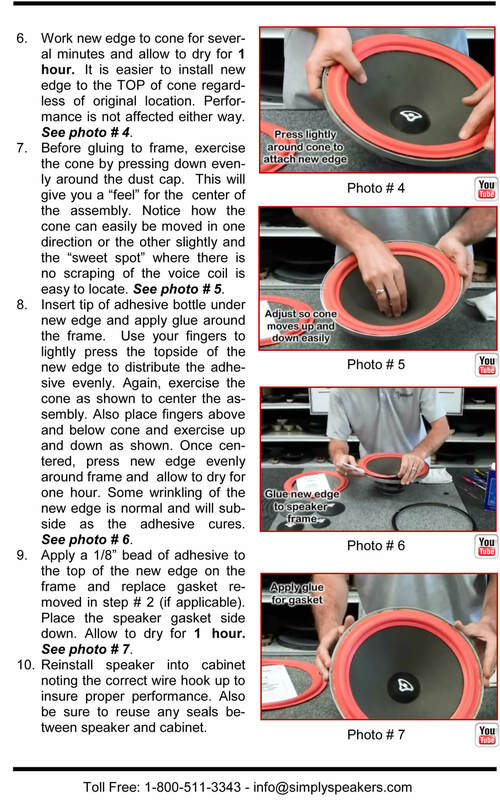 A: Some versions of the E312 woofers (CVW12) have a 9.25" cone, and the 12" Vega kit is designed for a 9.5" cone. If you have the 9.25" cone, we suggest our regular gray kit part # FSK-12A which runs a bit smaller and fits the cone properly. 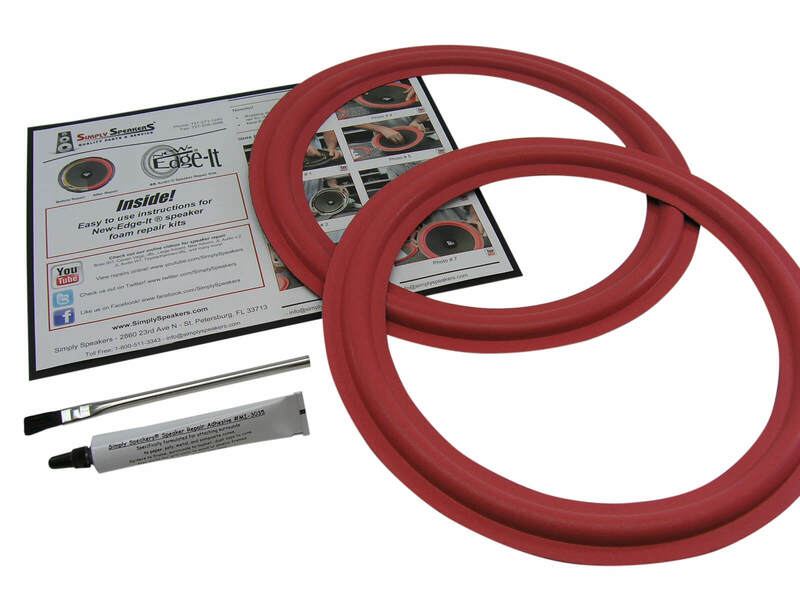 Q: Will this repair kit work on the AT-12 series? A: Yes! This is the correct kit for the AT-12 and ATW-12 woofers. 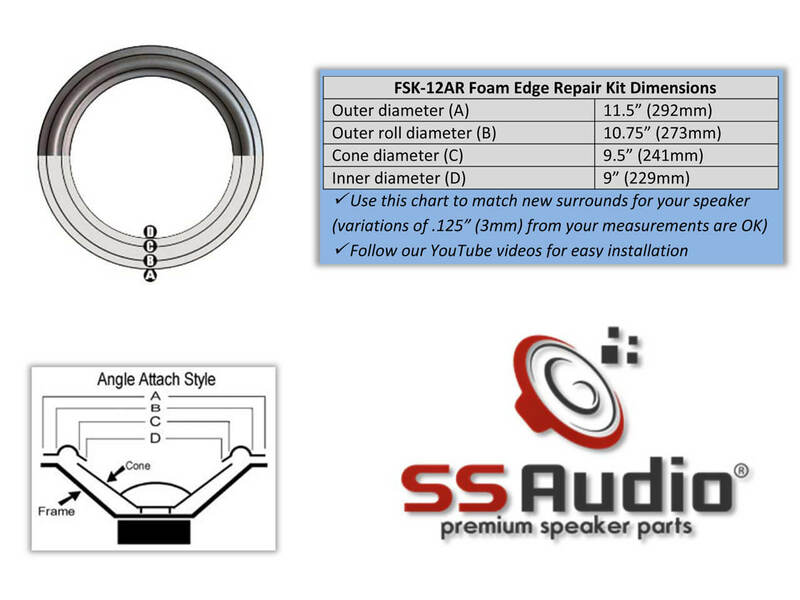 A: Our FSK-12AR is the correct repair kit for your model. Add the kit to your cart to see the shipping options and costs for your country. A: Yes, this kit will fit all home hi-fi Vega models with a 12" frame and 9.5" cone, including subwoofers. Thanks! A: Yes, this is an angle attach surround. All dimensions are listed on our product details page for easy viewing. Dust caps are sold separately if needed. 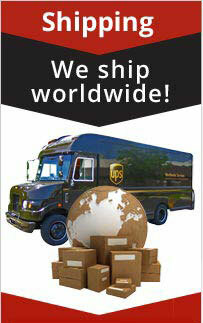 We also ship Internationally. Add the item to your cart, then enter your country and postal code to see shipping rates. Thanks! 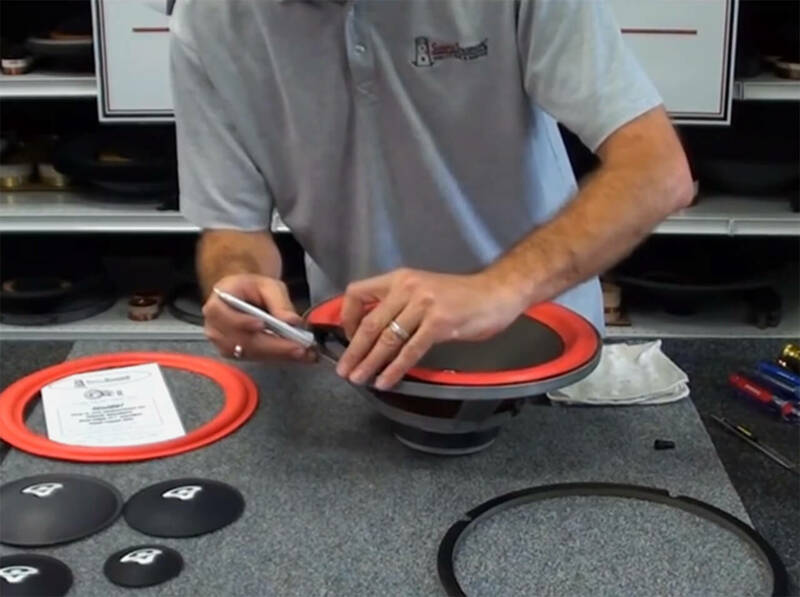 A: Yes, this kit fits all Cerwin Vega home hi-fi woofers as long as they are 12" diameter. Q: I am pretty sure these will fit my speakers but want to be positive?. I have HED MODEL CV-3000. The cone is 9.5" across and the frame is 12". Thank You! A: Thank you. Yes! 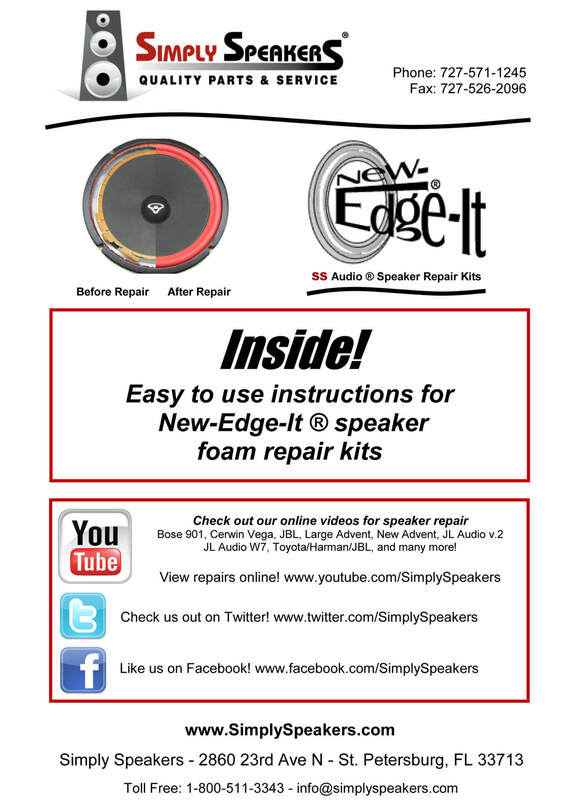 This is the correct foam speaker repair kit for the Cerwin Vega CV-3000. A: Yes, this kit fits the Cerwin Vega LE-12s. 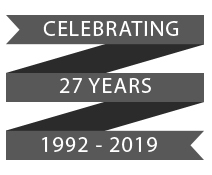 Cerwin Vega: 25, 12-T, 12T, 12-W3, 12W3, 12-W4, 12W4, 122D-2, 122D2, 122T-2, 122T2, 123W, L-122, L122, 122-W2, 122W2, 122S4, 122-S4, 211R, 311, 312, 313, 36R, 39P, 1210, 1230, 280-SE, 280SE, 300-SE, 300SE, A-123, A123, A-324, A324, AT-12, AT12, ATW-12, ATW12, AT-60, AT60, AT-80, AT80, CD-50, CD50, CD-70, CD70, CH-124TR, CH124, CV-12B, CV12B, (CVW12 cone runs small), DC-12, DC12, DC-12W, DC12W, DX-5, DX5, DX-7, DX7, D-5, D-5E, D5, D5E, D-6, D6, D-7, D7, DCW-12, DCW12, DXW-3, DXW3, DXW-5, DXW5, DXW-12, DXW12, (E312 cone runs small), E-712, E712, HED-1230, HED1230, HTW-122, HTW122, L-1211, L1211, L121-4, L1214, W12-4, W124, W-121-4, W1214, LS-12, LS12, LW-12, LW12, M-80, M80, MX-250, MX250, MXW-12, MXW12, N-12, N12, PD-6, PD6, PD-2, PD2, RE-30, RE30, RE-30B, RE30B, REW-12, REW12, R-123, R123, R-24, R24, R-26, R26, RW-12D, RW12D, S-1, S1, SW-12, SW12, SW-12B, SW12B, U-12, U12 HED, U-123, U123 HED, U-321, U321 HED, UT-12R, UT12R, VS-12, VS12, VS-120, VS120, VSW-12, VSW12, VW-12P, VW12P, W12-4, W124, XL-12S, XL12S, XL-12D, XL12D, and many more!